A Hurricane or Peace? - Andria Corso & Co.Andria Corso & Co.
My husband and I vacationed in Hawaii last month, and as with most long vacations we take, they tend to be preceded by any number of things occurring at home. In fact, our pets have a habit of always getting sick right before we leave. Always. At least one of them. I am acutely aware of this pattern so was happy I felt a sense of peace a few weeks before we left. Everyone was healthy, and I was focused upon healthy critters and peace for the next month, through our vacation. It didn’t work. In fact, despite all the peace I’d focused on leading up to our departure, I got the complete opposite. The week before we left, not only did one of our dogs end up sick at the vet, but one of our HVAC units decided to crap out two days before we left. Of course, it wasn’t an easy fix so the air conditioning on one side of our house would be inoperable during the time our pet sitter was staying there with our pets. Now, you might not think either of these is a big deal, and in the grand scheme of things they are not. However, I was beyond frustrated. What on earth was this pattern of things always getting chaotic before I leave for vacation? Why do I always need to leave pages of notes and texts for my (amazingly kind and patient) pet sitter? Why do I have extra things to be concerned about at home while I’m on vacation? Especially considering I was focused on creating PEACE!? Fast forward 10 days, we are in Hawaii having a wonderful time, and everything is great at home. We have 3 days left on our trip when we find out a category 5 hurricane is coming directly for Hawaii and supposed to hit Oahu (the island we were on) the day we were scheduled to fly out. What. The. Heck. Hurricanes never hit Hawaii. Until now. I will spare you the details of how frustrated I was having to spend the last 3 days of my vacation closely monitoring the weather, trying to (unsuccessfully) arrange for an earlier flight out of Hawaii, and having no option left but to simply pray that the hurricane would hold long enough for us to fly out on schedule. Now again, you might think getting stranded in Hawaii is not a big deal. After all, it’s HAWAII! But, not me. Especially when we had no alternative care arranged for our animals and did I mention a category 5 hurricane was potentially going to make a direct hit on the islands? Anyway, all the peace I had intended for myself and our vacation the prior month was, once again stolen from me. 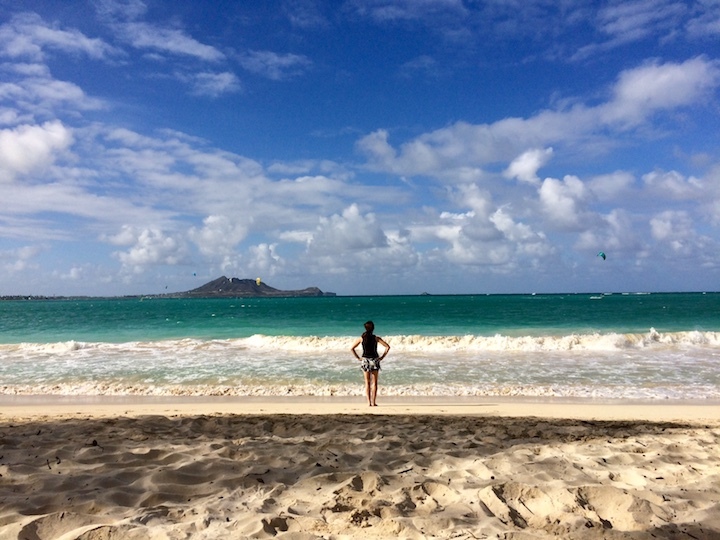 It took some quiet time on the beautiful beaches of Kailua to help me realize that maybe all this crap was the answer to the peace I was intending….? Peace, happiness, kindness, or any emotion or feeling we are attempting to generate in our lives is always a choice. It’s an internal state that is not based on external events. So, with all my intentions the prior month to create peace and then being presented with what seemed like anything but peace, I had a choice in each of those moments. I could choose to let fear, worry, and my hurricane force mind run the show and feel chaos. Or, I could choose to remember what I KNOW to be true in life: I am always exactly where I am meant to be, even if I don’t like it or would rather be someplace else. I intended peace, was presented with external events that were chaotic, and I had a choice: a peaceful focus or a fearful focus. That realization on the beach was what I needed to shift my focus. I finally felt the peace I had been seeking even though nothing changed. The hurricane was still coming. I still couldn’t get a flight out any earlier than our original plans, and yet, I chose to feel peace based on knowing I was (and would always be) exactly where I am meant to be. Intentions are great and when life hands us what we are intending, feeling happy and at peace is simple. But when the external events do not match how we want to feel inside, we still get to choose our reaction, where we focus, and how we want to feel. That is a peaceful thought all by itself. It’s always my choice. The result of the story is we actually got off Oahu before the hurricane hit. The storm miraculously slowed down long enough to enable us to get on our original flight and home precisely on schedule. It’s amazing (or maybe not) how that all happened after I decided that I was going to be at peace with whatever happened and whenever we ended up getting off the island. This entry was posted in Blog and tagged Andria Corso, Choices, choose peace, Fear, Hawaii, Hurricane Lane, let go of fear, peace, Stress reduction. Bookmark the permalink. 4 Responses to A Hurricane or Peace? What a GREAT and timely email to your fan base! At least for me, at this place in space and time. I’m experiencing my own hurricane after being virtually bed ridden for 4 months, and in a wheelchair for 14 weeks. I’m in bed as I write this, suffering crazy physical pain due to a secondary nerve condition that has set in. Of course, it only affects 5% of people who were injured. Of COURSE if would be me. LOL But, the lesson to having to surrender to WHAT IS, when we had other plans has been a great lesson in choosing PEACE. It’s difficult, but it’s the only way. Thank you, Beth! I am sorry to hear all you’ve been dealing with and am sending love and healing energy your way. You are strong! And will be stronger because of this. For the past year, I’ve been actively choosing to make choices based on the goal I wanted for the situation and not being swayed by the external events in my view. These things were not happening to me, it was only around me. I remind myself that I’m in it, but not of it. If I could not change the events, I relaxed my mind until it passed or another opportunity presented itself. It’s good to know that others are walking a similar path. Thank you for sharing, Michele. I love that you said you are ‘in it but not of it’ – that’s so true and a good reminder for us all.